Fashionable and affordable, the look of leather without the work. Waterproof, low maintenance synthetic paddock boots are 100& washable and clean easily with just soap and water. Designed with a larger toe cap area for a more comfortable fit. 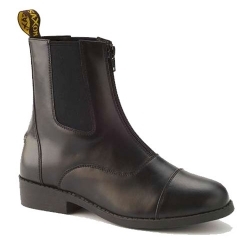 These boots are ideal for schooling and vacation riding.